In recent years, the world of cinema has indeed been preoccupied with new stories from the famous spin-off movie. Great characters began to be appointed to the big screen with their solo films. Maybe you know the Marvel Cinematic Universe that will soon make a spin-off for Black Widow or Han Solo from Star Wars. This time. Transformers has separated the story for Bumblebee. Aliens hiding in yellow cars and can transform back into super-powered robots. You must have known the Transformers block buster. In the first story, (Transformers 2007) Bumblebee is said to have existed on earth for a long time, only then did he call other robots to face the Decepticon (enemy). Here, I find it difficult to write Transformer versions of Michael Bay (Transformers 1 to 5) with Bumblebee version of Travis Knight (Kubo and the Two Strings 2016), because the storyline has been ruffled. Or it could be that Bumblebee will become a reference for Paramount Picture to remake this movie in the future. Tells a set in 1987, when Bumblebee was sent by the Autobot leader from planet Cybertron to earth because there had been chaos on the planet. At the beginning of his arrival on earth, Bumblebee had a chance to fight with Jack Burn (John Cena) the earth army from Sector 7. Until then 2 Decepticon enemies found Bumblebee and fought great. Even though Bumblebee managed in destroyed them, Bumblebee was seriously damaged and lost his voice. To hide, Bumblebee turns off and transforms itself into a classic VW Bettle and hides. 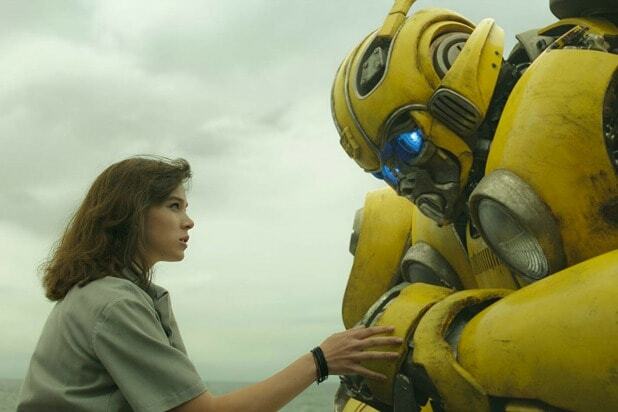 Bumblebee’s hideout finally ends when a teenage girl named Charlie Watson (Hailee Steinfeld) buys the broken car and repairs it. In the warehouse, she was surprised to learn that the VW car could turn into a robot. The story began, they began to get familiar, Bumblebee wanted to save the earth from the Decepticon, and Charlie wanted to find her identity. In accordance with the title I gave. I can say that this Travis Knight version of Bumblebee’s movie will give a new feel to The Transformers Universe. Moreover, officially this movie has been declared as a Reboot for Transformers in the future. I myself want to see Transformers with a calmer feel. Unlike the Michael Bay version that has made Transformers feel very busy, coupled with absurd dialogues that make dizziness. For Bumblebee itself, I can enjoy the storyline that was built more humanely, the 80’s setting was very pronounced. My disappointment with this movie is because it’s Bumblebee more about Charlie Watson’s figure than Bee. In fact, this movie clearly takes “Bumblebee” for the title. Off the track! Well, this is my disappointment, Paramount Pictures should not rush to release this movie for. They must think a smarter concept to build Transformers. Okay, entertainment is still entertainment, and I enjoy this movie. Hopefully Michael Bay will not interfere with this Transformers franchise anymore LOL. Film yang bagus, saya sudah menonton nya. That sounds like a ripping yarn! I think I’ll have to check this out. Thanks for sharing, Mawardi.